Quarry #10 near Morrison, or Clay Saurian #1, as drawn by Rev. Arthur Lakes. One hundred forty years ago this month, Morrison entered the history of paleontology in an impressive way, with the discoveries made by Rev. Arthur Lakes on the hogback north of our small town. 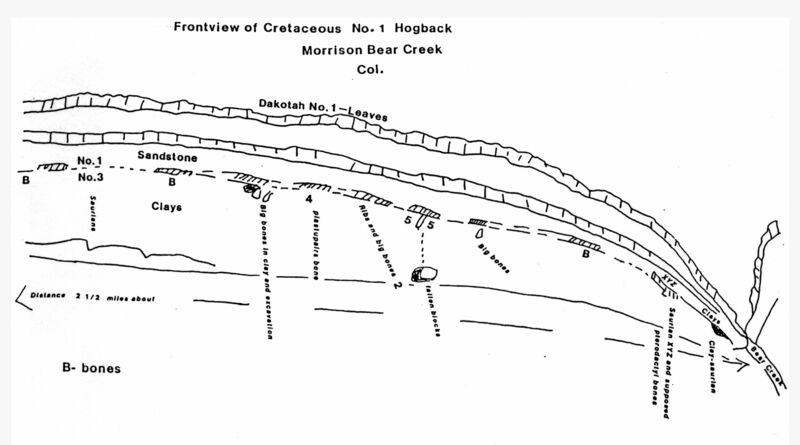 Arthur Lakes sketch of the quarries along the west slope of the Dakota hogback, from a letter to in 1879. Ultimately, Lakes agreed to send the dinosaur bones discovered at Morrison to Professor O.C. Marsh at Yale’s Peabody Museum. For the next two years, Lakes and colleagues (including Benjamin Mudge, in white in above drawing) continued to send bones and reports to Marsh documenting their work at 14 sites along the hogback. 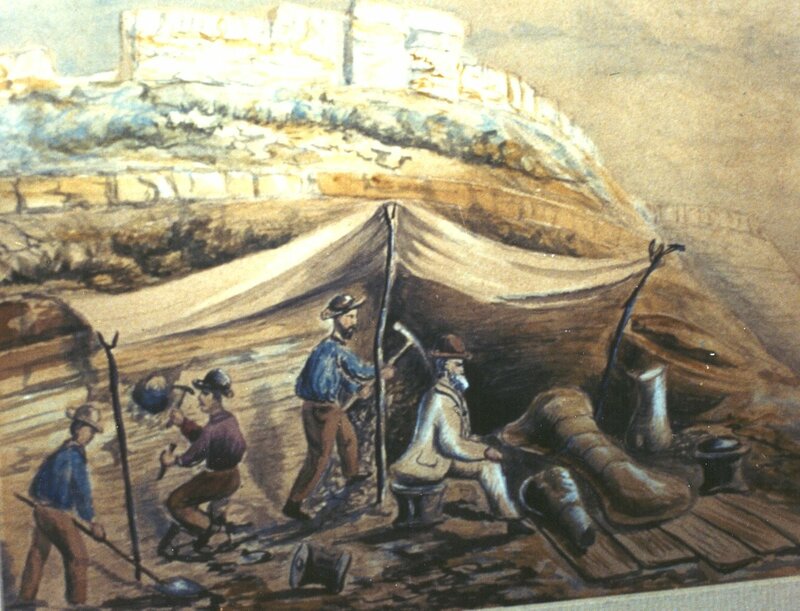 Lakes also recorded their activities in his diaries, leaving us an extensive historical record of Morrison’s part in the “Bone Wars” of the late 19th century. Only four of the quarries yielded significant discoveries. Quarry #10, the Clay Saurian, is known for Apatosaurus ajax (YPM 1860). This site near the southern end of Dinosaur Ridge was relocated in 2002 and has been worked since then by teams from the Morrison Natural History Museum. Based on Lakes’s sketches of the hogback, his diaries, old photos, and field surveys, the location of Quarry #1 was identified in September of 2009 (Ghist & Simmons, 2010). The rediscovered quarry site was named a county landmark in 2014. This and other sites along Alameda Parkway are managed and interpreted by the Friends of Dinosaur Ridge. Hunt, Adrian, Lockley, Martin and White, Sally. 2002. Historic Dinosaur Quarries of the Dinosaur Ridge Area Friends of Dinosaur Ridge and the University of Colorado at Denver Trackers Research Group. JCHC. 2014. Preserving Prehistory: Friends of Dinosaur Ridge, Meyer Award for Historic Preservation. In Historically Jeffco magazine, Vol. 35: 39-40. Jefferson County Historical Commission. JCHC. 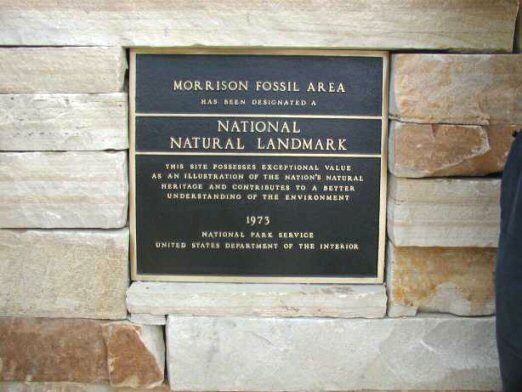 Dinosaur Ridge Describes Dedication of National Natural Landmark in May 2004. This entry was posted in Events, story. Bookmark the permalink.